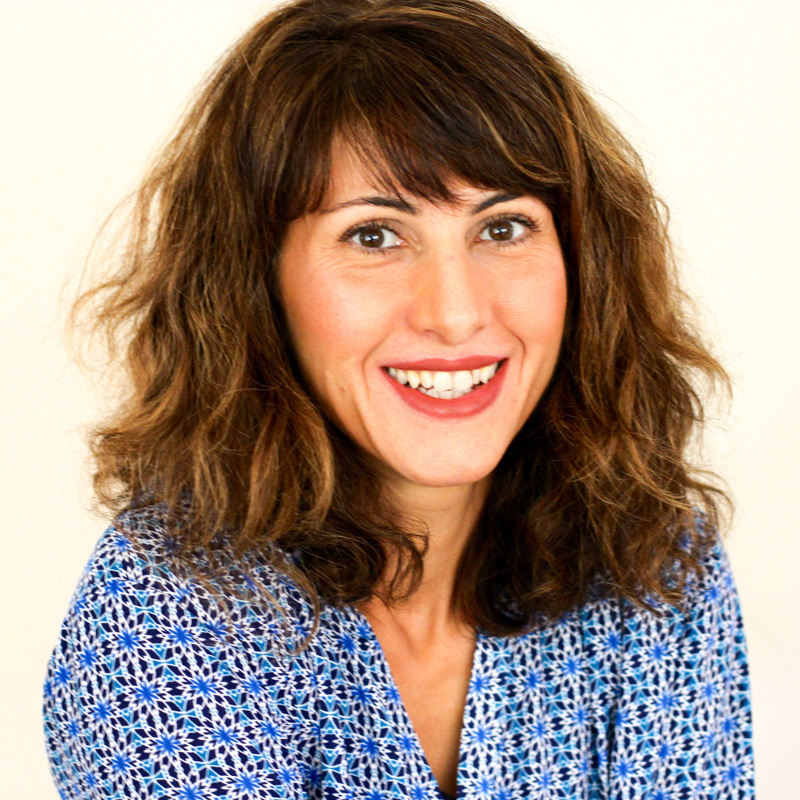 Hellooooo everyone, so thrilled to be back cooking for you guys again!! That maintenance mode page was so annoying – sorry and thank you for your patience! I can’t believe Memorial Day is just about here. I know I say this all the time, but time just goes way too fast for me! If you happen to be cooking this weekend and want to kick off the unofficial let’s pretend start of summer in true casual, kick-back style then have I got a sandwich and side for you! 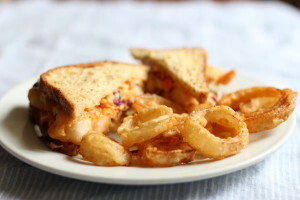 I made us what I would call my comfort food version of a shrimp po’ boy sandwich and the best onion rings EVER! True, it’s not really a shrimp po’ boy sandwich nor a “comfort food”, in the traditional sense (according to the food experts), but regardless, this sandwich + onion rings will have you feeling quite comforted and very well satisfied the way a shrimp po’ boy would. 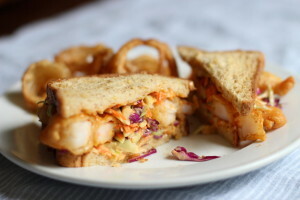 Simply put, this is a delicious sandwich you must try — crispy shell coating delicately plump shrimp partnered with a good slather of tangy horseradish coleslaw, and creamy aioli (fancy french word for mayo-based sauce) all piled between some yummy toasted multi-grain bread BUT NOT WITHOUT the onion rings. You must go the extra mile and fry up the onions. You will thank me later. And don’t try to bake these either, it’s not the same. As much as I’m into nutrition, sometimes we just need to look the other way and fry away. well, unless you needed to impress the Queen of England or future in-laws, then maybe go with something else. Now I’m not a big sandwich person, more of a toast-with-topping kind of gal (have you tried honey sesame seed butter with sliced banana, oh man) but this sandwich had me at every bite, as I wiped up my face in pure delight without any trace of greasiness. I talk more about that in my notes (thanks to Thomas Keller’s French laundry Cookbook – light & crispy frying ever since!). To make life easier, I prepared many of the components in advance (aioli, coleslaw, and tempura). 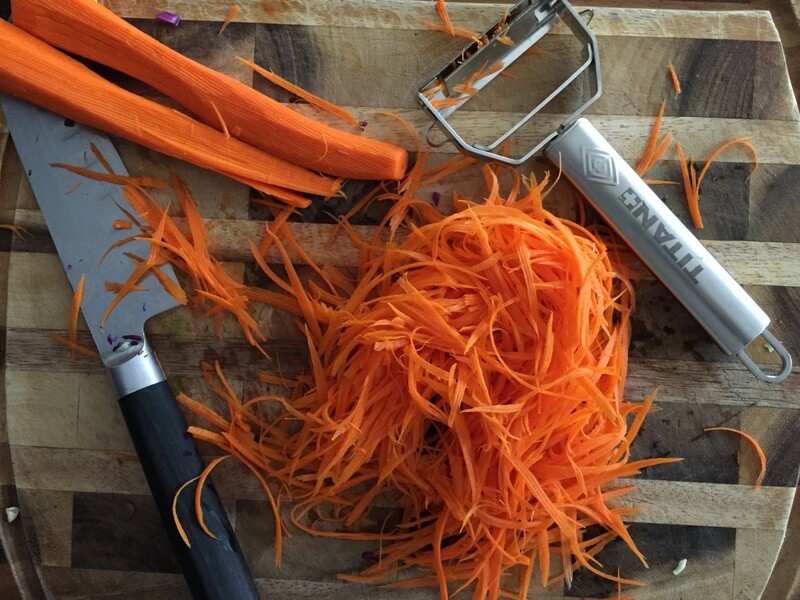 The little tool here slices the carrot in julienne style (sold at Bed Bath Beyond or online)… and if you love coleslaw, like we do, make extra – it goes so well with grilled Salmon (troll-caught king salmon is back in season), burgers, veggie skewers, anything really. I guess I should also say that for onion rings, and fried shrimp … around here (with my 5 guys) larger portions are typical, go ahead and reduce or double serving sizes if needed. Either way the recipes are easily adjustable. You can do all of this in one day, but no need to. The only thing that I recommend is to fry the same day, just before serving, otherwise you will have soggy fried shrimp and mushy bread. Oh, and psst, guess what? I use the same batter for the onion rings. Yep, as crazy as it sounds, believe me, there is no trace of shrimp flavor in the onion rings. Wait until you taste these onion rings. I’m warning you, they’re addictive. Happy to be back after what felt like an eternity. Just when I thought my make-over would take a week, I discovered some glitch/viral stuff that I had to tackle. Good news: Battled the beasts with the help of my fabulous son (who also gave the site this make-over by the way!). Teaser alert coming soon: Blackberry pie anyone? In the meantime, have a safe, fabulous, and delicious Memorial Day weekend! 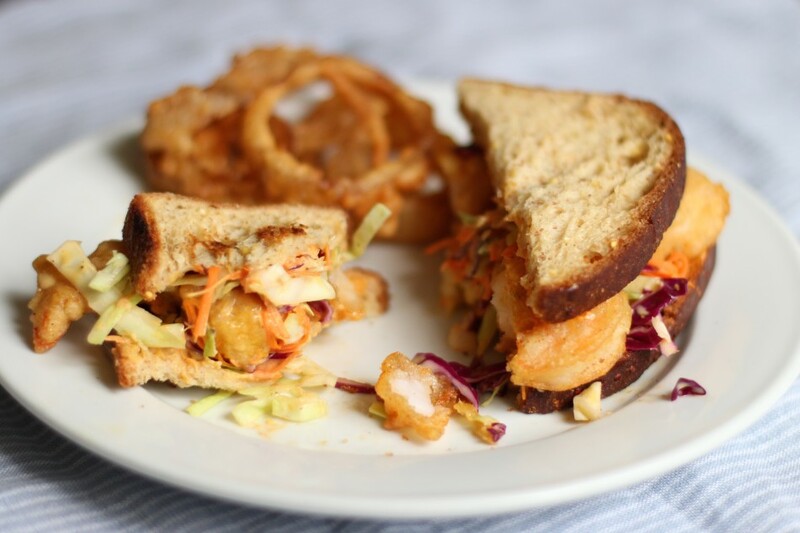 Simply put, this is a delicious sandwich you must try — crispy shell coating delicately plump shrimp partnered with a good slather of tangy horseradish coleslaw, and creamy aioli all stuffed between delicious whole grain bread PLUS a side of the best light & crispy onion rings EVER. Gluten free, dairy free, and soy free. Happy Memorial Day Eats! 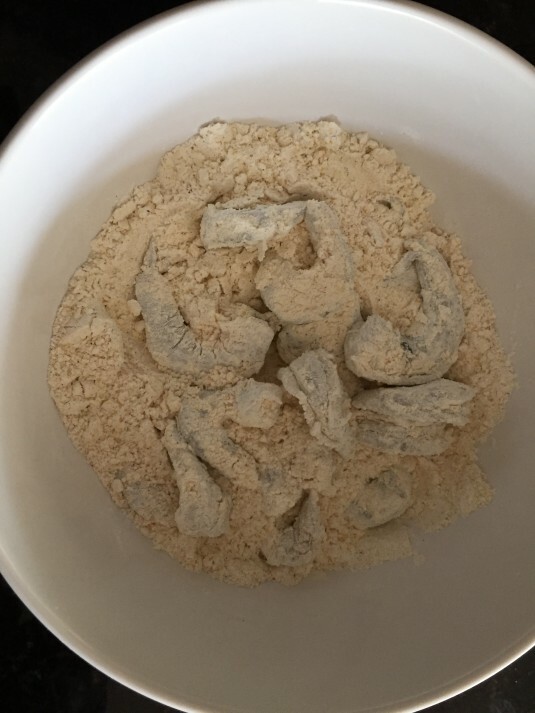 Note: The shrimp should sit in the flour mixture for a few hours or overnight. Prep time of 4 hours includes 3 hours of tempura chilling time. In a large bowl, whisk together the flours, salt, and pepper (I just use a fork and stir until it looks combined). Toss all the shrimp (remember to remove shells and devein the black stringy stuff along the back of the shrimp) into the flour mixture. Mix well then chill in the refrigerator for at least 3 hours. When chilled, add sparkling water, stir well. It will be very thick, similar to pancake batter. Meanwhile, add oil into a cast iron dutch oven (like a la creuset) or a deep stainless steel saucepan with a candy thermometer attached then set stove top heat to medium high and wait for the oil to reach 375-380 degrees F (190-195C). Ideal frying temperature is 350 F, once you add about 5 shrimp it will quickly reduce to 350 F - that’s the temperature we want to maintain during frying. When ready, push each shrimp into the bottom of the bowl where it’s thicker since the flour will tend to sink to the bottom after a while, then lift out and wait a second for any extra to drip back into the bowl. Immediately (and carefully!) add shrimp, one by one to the oil. They should be fully immersed in the oil. Do not overlap or crowd the pot, otherwise they will not crisp up to perfection. About 6 jumbo shrimp per batch. Cook for about 3 minutes. No need to turn over since they are immersed in the oil. Note: Do not add more shrimp yet! 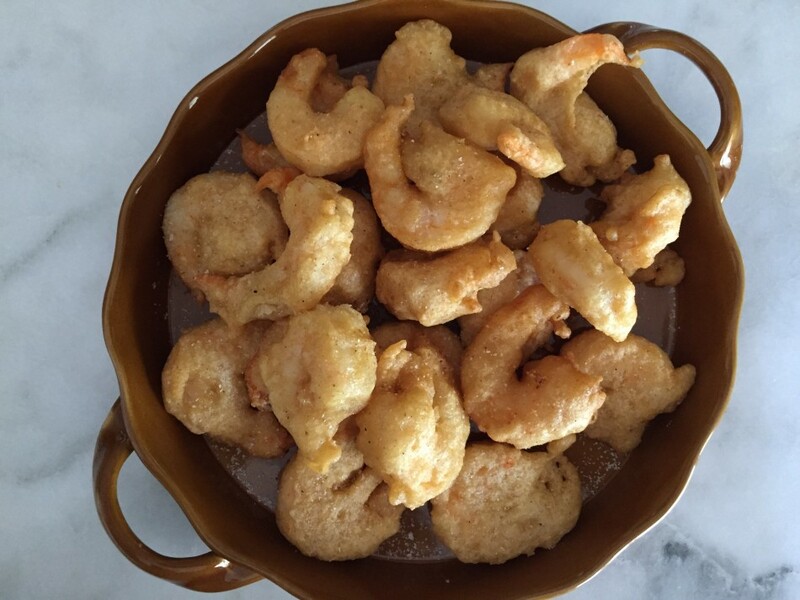 Wait for the temperature to come back up to 360 degrees F (182 C) because the tempura shrimp will cool the oil significantly and lower the frying temperature by 15-30 degrees, creating soggy, greasy food. Lift out using a spider spatula (looks kind of like a mesh strainer bowl attached to a wooden handle). Transfer to a heat proof dish. Sprinkle a little kosher salt over each batch while hot so the salt adheres to it. Continue to cook in small batches until all are fried. To keep warm: Put in a 300 degree F (148 C) oven or toaster oven until ready to serve. Separate the onion rings (push out the small rings first to prevent breaking the larger ones) and add into the tempura batter after shrimp have been fried. Move the rings around to redistribute the thickened batter. If it has gotten too thick to coat, add a splash of sparkling water. When the oil temperature is back up to 375 degrees F (190 C), slowly (and again, carefully, it can splatter!) add one ring at a time until you have added enough to fill the pot but not overlapping them. Fry for about 2 minutes or until golden brown. Lift out, drain and transfer into a large bowl. Sprinkle some kosher salt. Repeat until all onion rings have been fried, sprinkling some kosher salt over every batch. Keep warm, if needed in a 300 degree F (148 C) oven until ready to serve. Shrimp and onion rings will stay crispy in the warming oven up to 30 minutes before serving. Longer than that could make it soggy. Combine all the ingredients in a large bowl and toss to combine well. Whisk all the ingredients until well blended or mix in a food processor if using fresh garlic (I used fresh garlic). Toast the bread, smear aioli on each side, slather on some coleslaw and 4-5 shrimp. Cover, then press down gently and slice in half. Serve with onion rings and extra aioli on the side. Welcomeback!! Beautiful look and beautiful recipe!! Thank you Jenn for your kind words! I'm blushing right now. It makes me so happy to hear and I missed you too!! 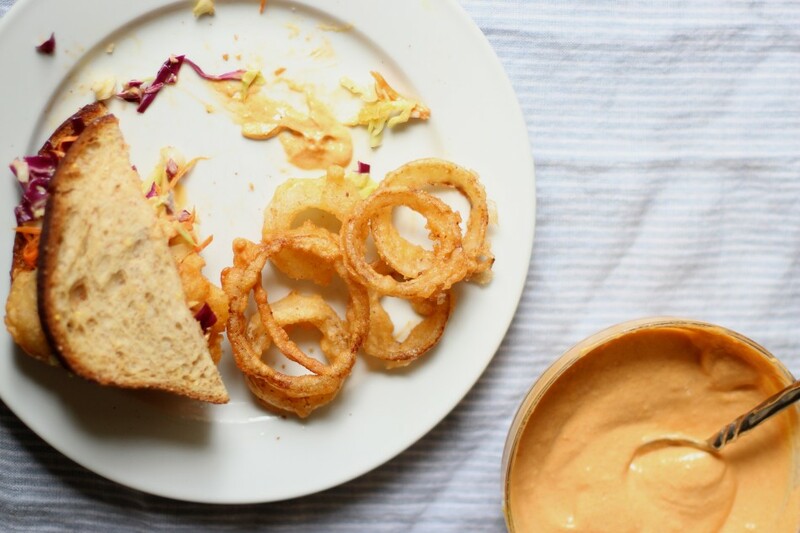 Wow your blog looks amazing and so does this recipe but OMG the onion rings are killing me. I need this in my life! OMG. When I opened the email from you I couldn't believe how different it looked. 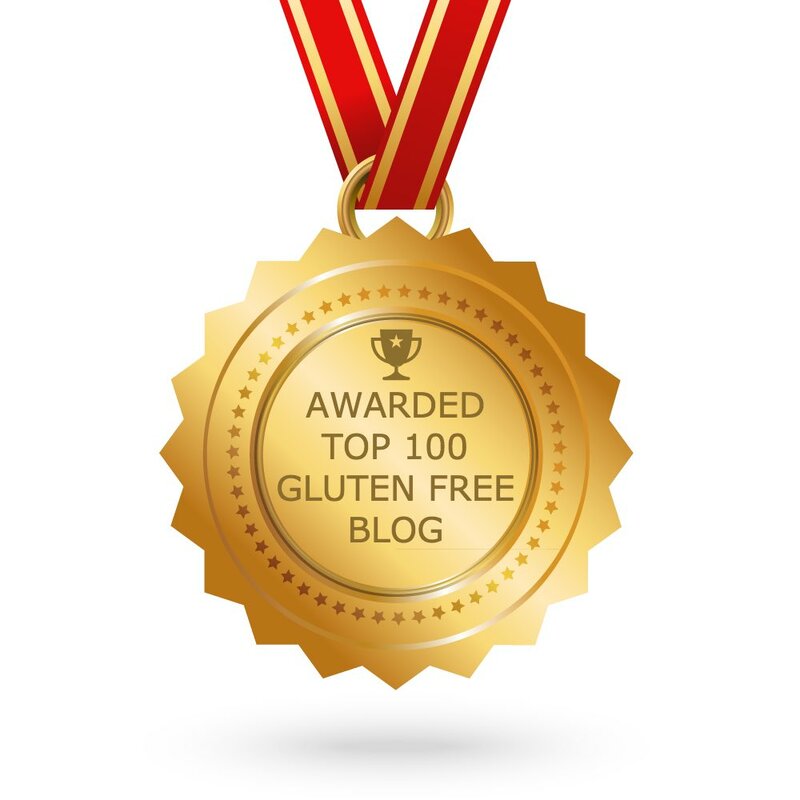 Your blog name looks so beautiful, nicely done I almost forgot about the sandwich! This I need in my belly now! Happy your back sharing your recipes Jessica :) Your blog looks beautiful and I like the 2 columns showing more posts on one page and I think the drawing of your blog name is stunning! Is that a template or did someone paint that by hand? Thanks so much Melissa, glad you like it! This incredibly talented artist from Australia whom I found online hand-painted the design for me. 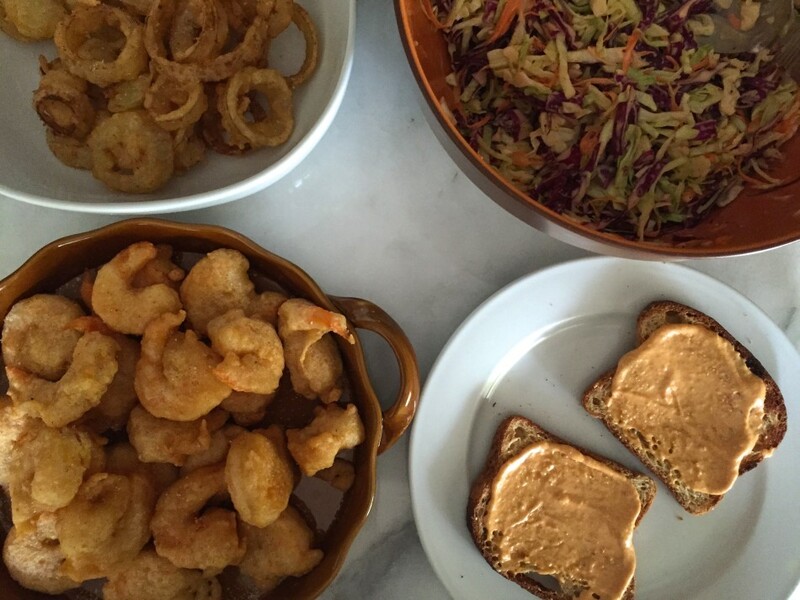 Your shrimp & slaw recipe looks really yummy and those onion rings ....wow. I have been reading your blog since December and never comment but had to after this post. I was just telling my husband how I can pretty much give up po boy sandwiches (my favorite sandwich) because how will I ever be able to recreate it and then I find you back in my inbox (missed your posts) with this. My jaw dropped. I agree with you, not exactly a po boy but Jessica this sure comes close!! Wish you would create a gluten & dairy free baguette. Is that asking too much? I am running out with my shopping list and making this for lunch tomorrow. 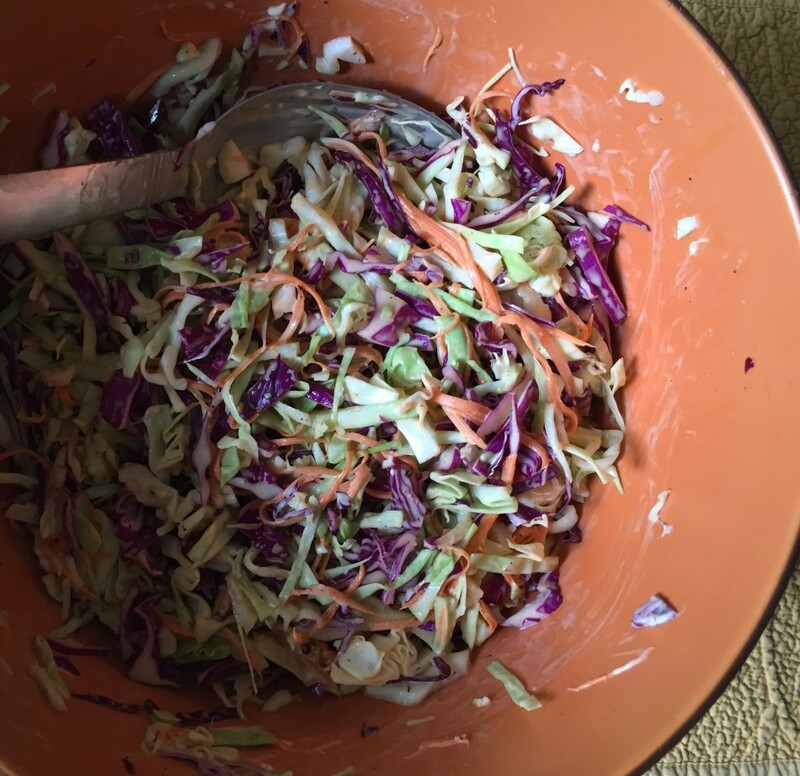 Thank you for sharing this and all your awesome recipes that have satisfied many cravings! P.S.- I got so excited about the sandwich I forgot to mention how lovely your blog looks, your son did an incredible job but he probably doesn't mind as long as he's fed food like yours! AWW, thank you Christi for your touching comment, it makes me so happy to hear that. It is the best feeling when we can have our favorite foods again that's for sure! I have been tweaking a baguette recipe the past month and feel confident to share the awesome recipe soon, just testing how it does in the freezer after baking - funny you mentioned it!! I'm in love with the new look!! Ooh so pretty! Love the blog name design! This looks delicious I'm not a big shrimp fan, can I make this with chicken or will it not taste the same? Thank you so much Laura, I love it too :) Sorry to answer your question so late. Yes, you sure can. The tempura is wonderful for chicken, vegetables, fish, anything really. You can also make it spicy if you like with some cayenne added to the flour. Enjoy! Hope you had an incredible long weekend! Curious to know what you're looking to make next in June! Thank you, we did. I hope you did too! Gosh, lots of good eats... I have more pie on the brain, cakes to celebrate middle school graduation and my twin boys 11th birthday, some quick and easy picnic-style salads, a baguette recipe that I have been working on and homemade jams! I have been missing a fried shrimp sandwich for ages. 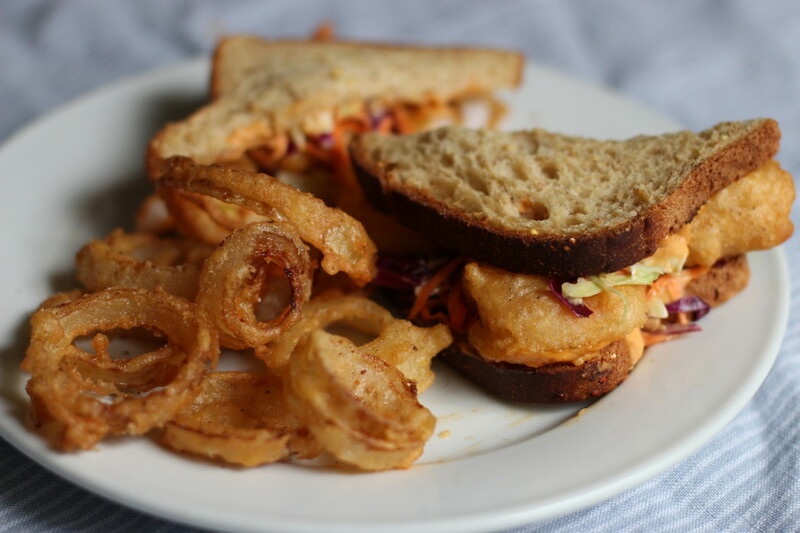 I gave this recipe a try, including the onion rings, and it came through with amazing results. I fried the shrimp and kept it in my warmer while frying the onion rings. I added some chili powder to the shrimp because we like our food spicy, other than that followed the recipe. Thanks for sharing delicious food that does not make me feel like I'm missing a thing. Aw, gee thanks Caitlin, you are so sweet. You are so welcome, enjoy! I can't find horseradish mayonaisse, will regular mayonaiise affect flavor much? Want to make this Sunday. TIA! Sorry for the late reply Frank! Any mayo will do, the horseradish mayo just has an extra kick. Hope you enjoyed it!